Carmelo Anthony is going to Chicago, albeit only on paper. Where he’s going next remains unclear. 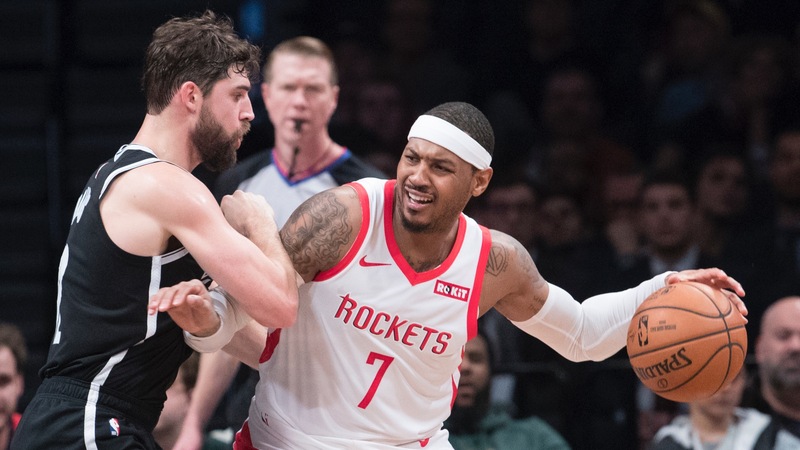 MILWAUKEE (AP) — [Carmelo Anthony](https://www.betchicago.com/carmelo-anthony-next-team-favorite-nba-china) is going to Chicago, albeit only on paper. Where he’s going next remains unclear, though the Lakers might be an option. <a href="https://twitter.com/wojespn/status/1087481707673149442?ref_src=twsrc%5Egoogle%7Ctwcamp%5Eserp%7Ctwgr%5Etweet" class="embedly-card" data-card-width="100%" data-card-controls="0">Embedded content: https://twitter.com/wojespn/status/1087481707673149442?ref_src=twsrc%5Egoogle%7Ctwcamp%5Eserp%7Ctwgr%5Etweet</a> A person with direct knowledge of the matter said the Houston Rockets are trading Anthony and an undisclosed amount of cash to the Bulls in a deal that is expected to be completed Tuesday. The person spoke to The Associated Press on condition of anonymity Monday because the trade still needs league approval. When that comes -- the only reason why it didn’t happen Monday is because the NBA office was closed to commemorate the Dr. Martin Luther King Jr. holiday -- Anthony will have a new team, though still won’t be back on the floor. The Bulls (11-36, 21-24-2 ATS) have no plans to play Anthony and will look to either trade him before the Feb. 7 deadline or ultimately waive him and make him a free agent. __MORE:__ [Oddsmakers keeping pace with increased scoring](https://www.betchicago.com/nba-scoring-increase-oddsmakers-keeping-pace) | [Time to fade the Rockets](https://www.betchicago.com/james-harden-fade-rockets-betting-capela) The trade ends a short-lived saga in Houston for Anthony, who averaged 13.4 points in 10 games with the Rockets. He has not played since Nov. 8. Anthony was traded by Oklahoma City to Atlanta in July, a move that preceded the Hawks releasing him to sign with the Rockets. The Bulls, technically, will be Anthony’s fourth franchise in seven months, with likely one more to come before long. “We just had to see how things worked out,” Rockets coach Mike D’Antoni said in November when the team said it was parting ways with Anthony. “And the way we play probably wasn’t conducive to his game, and he was trying to make the necessary sacrifices and it wasn’t fair to him as a Hall of Fame player to play in a way that wasn’t good for him, wasn’t good for us. It just wasn’t a fit.” Anthony is a 10-time All-Star who has averaged 24.0 points and 6.5 rebounds per game in his career. He was the No. 3 pick in the star-studded 2003 draft class that also included No. 1 LeBron James, No. 4 Chris Bosh and No. 5 Dwyane Wade. The Bulls snapped a 10-game losing streak with [a 104-88 win in Cleveland](http://www.espn.com/nba/game?gameId=401071368) on Monday as a 2.5-point favorite, only the second game this season they've been favored. __PLAY:__ Our free [Daily NBA Pick 5 contest](https://betchicago.chalkline.com/games/nba-pick-5). Correctly pick five games against the spread to win a BetChicago prize pack.